Many decades in the future, when human nutrition is finally a reputable science, our current tendency to think of foods in categories like “good for you” or “bad for you,” will seem quaint. We will probably find not only that all foods have both helpful properties and less helpful properties, but that those properties are enhanced, dampened, or reversed depending on many, many factors like quantity, preparation, combination, microbiome ecology, genetics, epigenetics, other physiological factors, environmental factors, psychological factors, and who knows what else. I don’t say this to insult people who spend their time thinking about nutrition and diet, but to point out a useful fact. When science tackles any very complex topic, the knowledge it turns up, even if it was basically correct, always seems quaint 100 years later. That goes double for folk wisdom and other less-rigorous forms of collecting knowledge. To the extent that such a category exists, it is looking like chocolate may be “good for you.” I won’t go into how or why, as there are a zillion articles about that, all waiting to be proven wrong or quaint, but there is a strong chance that eating chocolate is largely helpful. The problem is that chocolate tastes terrible by itself, so it is almost always sold in combination with sugar, a food that is very, very likely “bad for you.” Sugar has the power to make chocolate and many other foods taste great, but also the power to screw you up in a bunch of ways; the Satan of food, if you will. What is your minimal sugar requirement to make chocolate tolerable? How about pleasurable? It’s easy and fun to figure out. (Although while I was figuring it out in a grocery with my friends, Abbi and Matt, a woman said, “You are ruining chocolate for me. Make a choice and get out.” Clearly this is not fun for everyone.) It just takes a grocery with a decent chocolate selection, a little math, and some chocolate money. 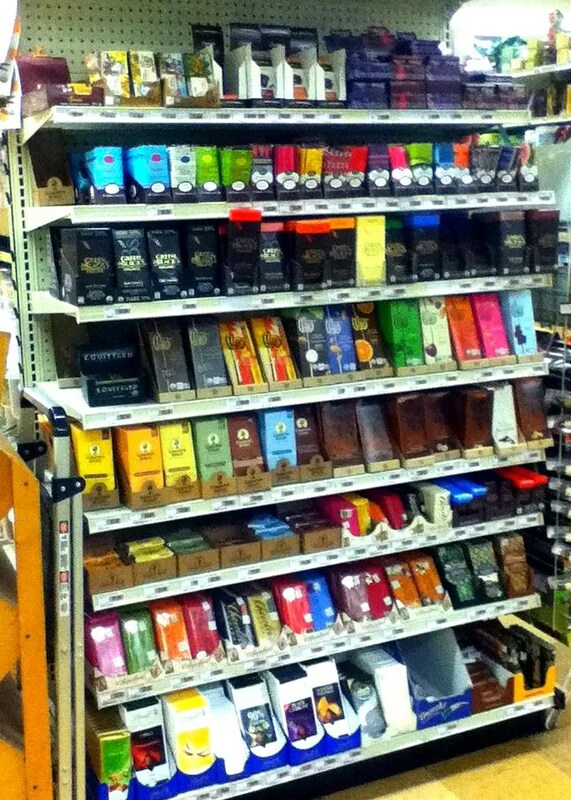 Chocolate selection at the Kiva, Eugene. Site of ruining chocolate for one woman. Hershey Special Dark dark chocolate bar, sugar mixed in. The six squares on the left would be pure sugar. That’s a lot of sugar. The lowest-sugar bar at the Kiva was Lindt Excellence 90% Cocoa Supreme Dark bar, at 7.5% sugar. That’s like almost one of one of the squares above. I found it taste tolerable–enjoyable, even, but more in the way wine can be enjoyable than in the way I normally expect chocolate to be enjoyable. Interesting rather than incredibly delicious. I also found that I did not eat it nearly as compulsively as I do sweeter chocolate. The runners-up were E. Guittard’s Nocturne “pure extra dark chocolate” 91% cacao, at 8.8% sugar and Theo’s Venezuela 91% Cacao, at 9.5% sugar; each had the equivalent of a little more than a square of sugar out of the bar above, about 10 and 20% more sugar than the Lindt. These bars were easier to eat–less burned and bitter tasting, but still definitely in the enjoyable-like-wine category, a little smoother and maybe fruity or aromatic. 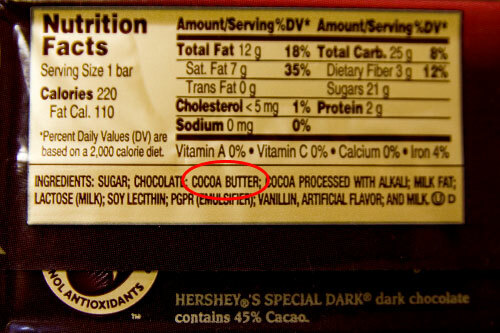 The rest of even heavy-duty dark chocolate bars were at 20% or more sugar. That’s at least almost three squares in the bar above. Green & Black’s Dark 85%, for example, is exactly 20% sugar. I haven’t tried it recently, but after eating these 3-10% bars, I expect it to taste quite sweet, with more than twice as much sugar as the runners-up and almost seven times as much as the Lindt Excellence. Sometimes the nutritional facts numbers do not add up. I noticed that with the Green & Black 85% bar. It’s got 8 grams of sugar per 40 gram “serving” in a 100 gram bar. That’s 20 grams of sugar per 100 gram bar, thus the 20% sugar I calculated. How is it, then, that the bar is also 85% cocoa? Chocolate companies, please explain your math. 4) The availability of high-quality video chat. 5) Number of days left before final reunification. Obviously, any such attempt will result in a major oversimplification, but I’m thinking we should stick with easily measurable factors. For example, the communication ability of each partner plays a huge part in the success of a LDR, but is difficult to measure, so I’m leaving it out. If the couple prefers not to fly for ethical or other reasons, it will factor in, too, but I’m leaving that out as well. And so on. 1) Cost of a round trip, divided by the combined income of couple. 2) Number of hours travel, round trip, by that mode of transportation. 3) Number of hours difference between locations, plus 1. So if you’re in the same time zone, you get a 1 here, and if you’re eight time zones off, you get a 9. The plus 1 is just to make a no-time-zone-difference a nonzero number, for calculating the index. 4) I’m going to estimate that having good video chat makes LDRs ten times easier, so if you have it, you get a 1 and if you don’t, you get a 10. 5) The number of days left before final reunification. It’s a start. Let’s see what kinds of numbers it gives us, using about what Reanna and I have left to go–a little over a year: For Bill Gates, the index would range between about .01 to maybe 30, depending on the difficulty of the trip, or between .1 and 300, without video chat. For someone poor, with a long, difficult trip that costs their yearly salary and no video chat, the index would be about 600,000. If this very unfortunate couple had 10 years to go instead of a year, they get 6,000,000. I know, that doesn’t sound like much of a relationship, but I’m looking for the upper end of the scale. Reanna and I get about a 30. Not too bad, I guess, though it goes up to 300 when I’m at Not Back to School Camp, which is way out on the information-dirt-road. So we get a range of 30-300, which is the same range as Bill Gates’ worst-case scenario–if he had to take his private Lear jet to the central Asian steppe every time he wanted to see Melinda. OK, here’s where you can help me out, if you want. There are certainly several problems with this scale. Here are two, off the top of my head: First, the range of .01 to 6,000,000 is too big to think very clearly about. How hard is my 30 compared to Bill’s .01, or Mr. Unfortunate’s 6,000,000? Other than “somewhere inbetween,” it’s difficult to say. The equation needs some kind of transformation to produce easier numbers, say between 1 and 100. Second, some things aren’t working out with the math. As it is, if a couple is very poor, even a 10-day LDR with an easy trip comes out harder than Bill’s 10-year LDR with a very difficult trip, as long as Mr. Unfortunate doesn’t have Skype. That can’t be right. If any of you are math people, what do you think? Third, there are other factors that should be included but are difficult to operationalize, like communication skills and depth of commitment. Any ideas, conceptual people?